Do you often wonder if there’s a difference, other than peace of mind? What are the biggest UK airports? 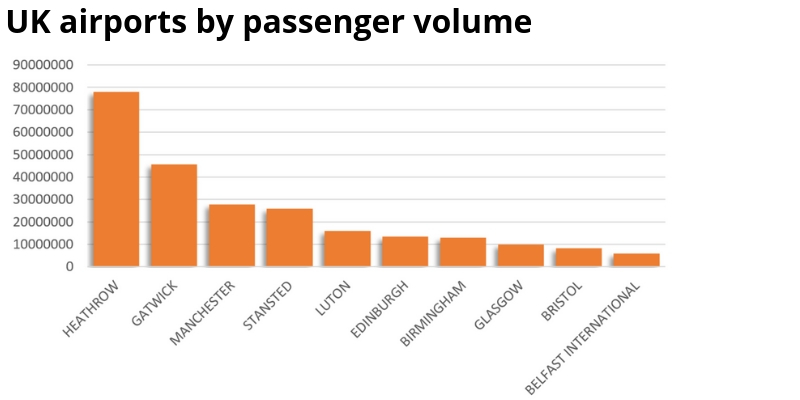 It probably won’t surprise many that the biggest UK airports in terms of airport passenger volume are London Heathrow and London Gatwick. The third largest airport by passenger volume is Manchester Airport(1). At London Heathrow alone, there are nearly 3 passengers for every 1 person who travels through Manchester airport in a year. You may expect car parking to be about 3 times as popular at London Heathrow as a result. Or at least double that of Manchester. 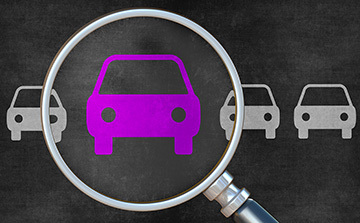 How many people are looking for airport car parking in the UK? What we found, is that Manchester has far more people searching for car parking than any other airport(2). In fact – there are 3 more searches for Manchester airport parking as compared to every 1 for parking at Heathrow. To put that into perspective, we estimate that 1 in 20 passengers flying through Manchester will be looking for airport parking (5.6% of people flying). In comparison, not even 1 in 100 people flying at Heathrow are looking for airport parking. We found that Heathrow has the lowest percentage of flyers looking for parking in comparison to its passenger volume at just 0.83%. In terms of popularity, Heathrow airport parking comes in as the sixth most popular location – a far cry from how popular parking may be assumed at this mammoth airport. It comes in after airports such as Birmingham and Stansted. Why is Manchester airport parking more popular than London? As the third largest airport in the UK and the first biggest non-London airport, Manchester airport could be more popular for car parking because it serves a larger area. For people living in London, more people may choose other routes – such as trains, or coaches to get to the airport. Heathrow may also deal with more interconnecting flights. Where people have flown from other UK airports or using it as a stopover on their way to different locations around the world. 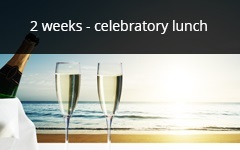 What does this mean if you’re booking airport parking? For flyers, these findings mean that the popularity and availability of parking may not solely be related to the volume of passengers the airport deals with every year. 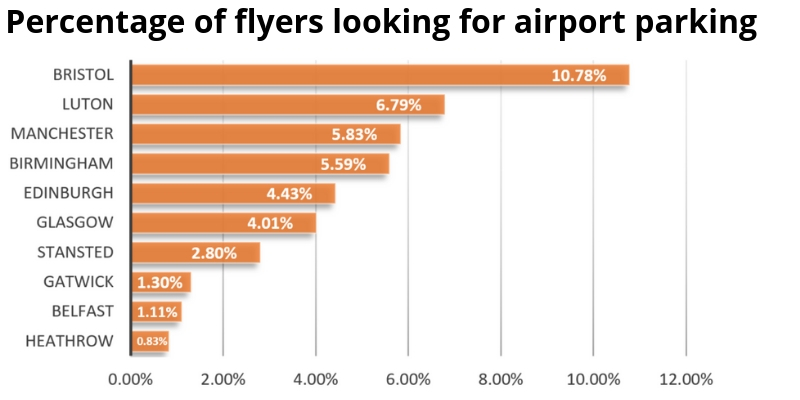 For example, we estimate that 1 in 10 flyers from Bristol airport are looking for parking – the highest frequency as compared to other top ten UK airports. What’s the difference between London and non-London airports? 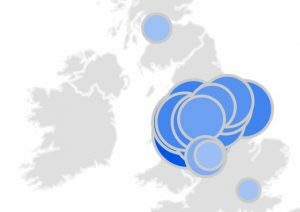 By comparing all UK airports, 3 out of every 5 people from 2017 flew from a London airport. To find out if certain London airports skewed the data on parking at Heathrow, we combined all London airports and compared the total amount of people looking for parking. From this, we found that non-London airports have three times more passengers looking for parking in comparison to those flying from a London airport. So, should I pre-book airport parking? It may be a good idea to think about pre-booking your parking ready for your flight. We estimate that 10% of UK airport car parking can only be pre-booked(3). So by only booking last minute, or turning up on the day, you’ll not have the same choice of parking facilities. We found that where there is a difference in price between booking on the day and pre-booking, it’s £3.70 more expensive per day to choose your airport car park last minute than pre-booking for a week(3). That’s not to say that you’ll always grab a bargain price. 1 in 4 airport car parks that offer pre-booked and on the day prices have no difference in price between pre-booked and on-the day. We also found rare occasions where car parking on the day can work out cheaper than pre-booking! At Glasgow airport, we found that on the day parking was 44p cheaper than pre-booking. This was caused by a last minute offer by the car park trying to increase the number of people booking with them. However, taking a closer look at car parking prices at the UK’s international airports, you can see a huge price difference between the cheapest pre-booked car park and the most expensive car park on the day. 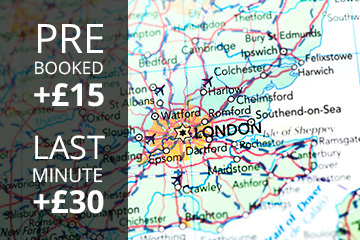 London Luton has the largest disparity between the cheapest pre-booked price and the most expensive price on the day. You could have to pay an eye-watering extra £141.49 simply because you haven’t planned ahead and pre-booked parking at Luton airport. That saving could pay for a hotel room upgrade, a couple of family meals out or you could indulge in duty-free gifts at the airport. It’s interesting to see that the smallest difference in cost for the London airports is at London Stansted at £35 – still a noticeable amount, but worth considering if you are not able to plan ahead and therefore pre-book, but you can choose the London airport that you fly from. Taking a look at the bottom of the graph, we can see that ​Belfast is the cheapest out of all airports to book on the day, although a saving can still be made of £25 if pre-booked – enough for a breakfast for two before your flights! 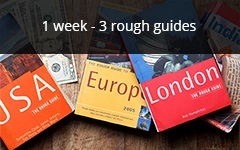 What can you afford with the money saved by pre-booking? Are London airports more expensive to park at? Parking in London will cost £15 more than other airports if pre-booking and £30 more if leaving it till the last minute. By comparing the difference in average cost of pre-booked airports versus other UK airports, we found that London airports were £15 more expensive than non-London airports to park at per week. 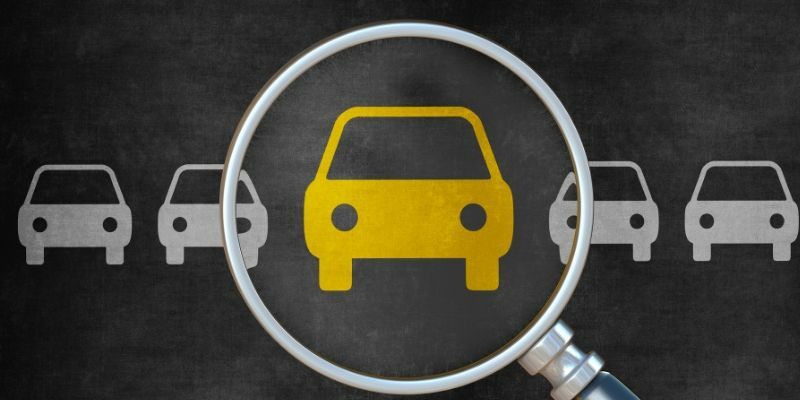 If you leave parking till the last minute and are booking on the day, then you should expect to pay an extra £30 on average as compared to on-the-day prices for non-London airports. From our findings, non-London airports have a much higher percentage of flyers looking for parking in comparison with London airports. This means that finding a car park could be more competitive than you might think. That’s not to say that London airport parking will be cheaper – in fact it’s often £15-£30 more expensive. We also found that it’s often better to pre-book your parking. For peace of mind and for a better price. So it’s worth doing some research to find out the types of cost difference from on-the-day versus pre-booking for the airport parking facilities you’re looking at. 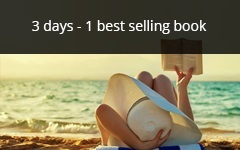 It could save you a few pounds which could be used to fund your holiday reading, your travel insurance, or even a VIP airport lounge! 2. Google Search Trend data pulled from SEOMonitor using exact match keywords to estimate annual searches in the UK. Heathrow search trend data is an amalgamation of each terminal + parking due to the large distance in between terminals. 3. Based on 60 airport car parks across 10 UK airports. 10th November to 17th November 2018 / 9.00am.